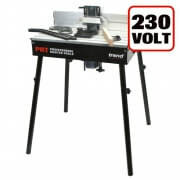 Professional portable router table with aluminium table surface and back fence for floor & bench mounting use. Back fence squareness adjustment for absolute accuracy. T11E quick release fixing holes for fixing T11 fixing kit. Bench leg level adjustment when mounted on a bench. 20mm hole for the T11 Quick Raiser adjuster handle. Floor or bench standing with removable legs and adjustment for uneven floors. Extruded 8mm thick aluminium alloy table top with minimal loss of cutter depth. Cutter aperture of 90mm allows use of the largest router cutters available. Cast back fence with extruded adjustable alloy cheeks and ‘T’ slots. Made to EN standards, with back fence accuracy of 0.5 degree & table flatness of 0.5mm. With a suitable size and weight enabling easy re-positioning around the workshop & transportation for on-site use. Router, fine height adjuster and spelch block not included. Removable centre plate of table will need to be re-drilled for other makes and models of medium & heavy duty routers. Not intended for continuous production or production line use.